The collection features 91 vacation packages, which include flight and hotel accommodations, options for stays ranging from three to 15 nights, and the ability to combine two or more regions. From skiing in Banff, grizzly bear viewing in BC, witnessing the Northern Lights in the Yukon, or tantalizing your taste buds in Toronto or Atlantic Canada, the Canada Collection has been enhanced to include 10 of the greatest ski resorts in Western Canada and three in Quebec, plus options for non-skiers like snowmobiling, dogsledding and wildlife adventures. It also offers up golfing, camping, cruises and urban getaways, as well as Fly & Drive and Fly & Rail vacation options. Air Canada Vacations has also partnered with Trafalgar to offer additional guided tours. The partnership lets travellers choose among eight Trafalgar Guided Vacations which include local experiences like enjoying Niagara ice wine or a dinner hosted on a family owned ranch in Kananaskis Valley at the foothills of the Canadian Rockies. 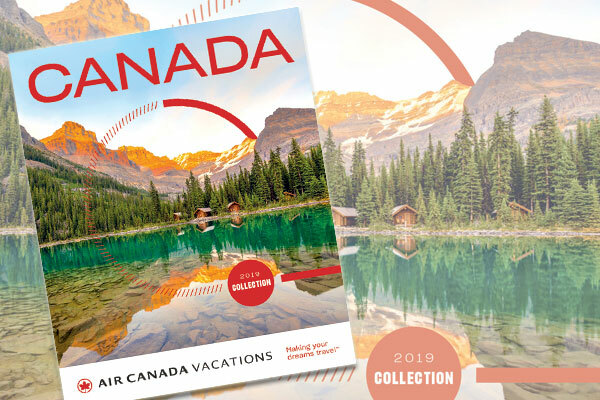 All packages come with round-trip flights from 63 Canadian cities aboard Air Canada and Air Canada Rouge, as well as hotel accommodations and options for guided tours, activities and car rentals. Travellers can benefit from free seat selection, a $100 future travel credit and 2,000 bonus Aeroplan Miles per couple.